A week or so ago I was one of the participants at the Sensing Divinity/Les sens du Rite conference, jointly hosted by The British School at Rome and École française de Rome. The two-day event (23-24 June) included speakers from the UK, Ireland, France, Italy, the United States and Mexico, all of whom presented papers related to the theme of incense. Topics of papers ranged from scientific studies seeking to make use of residue analysis in order to identify the different aromatic substances used in antiquity – this was not just frankincense (Boswellia), as I was to learn, but a host of other resins as well as herbs and flowers – and explorations of the archaeological and textual evidence for the context and meaning of incense burning and perfume use across the ancient Mediterranean – including Greek and Roman contexts but also Bronze Age Crete and ancient Assyria – to theoretically-driven investigations of the role of aromatics, and their related material culture, in the creation of particular multisensory experiences connected with public and domestic religious activities. A fascinating paper on Pre-Columbian rituals in Central Mexico provided a thought-provoking comparative perspective (not to mention some incredible iconography), and Esther Eidinow, in her excellent keynote address, exhorted us to consider how the senses, in this case smell, might offer a means of re-embodying existing cognitive approaches to understandings of the nature of divinity. Aside from the formal papers, one of the most valuable aspects of the conference for me was the opportunity to experiment with different types of incense and aromatics as part of a ‘demonstration’ held in the cortile of the BSR at the end of the first day. 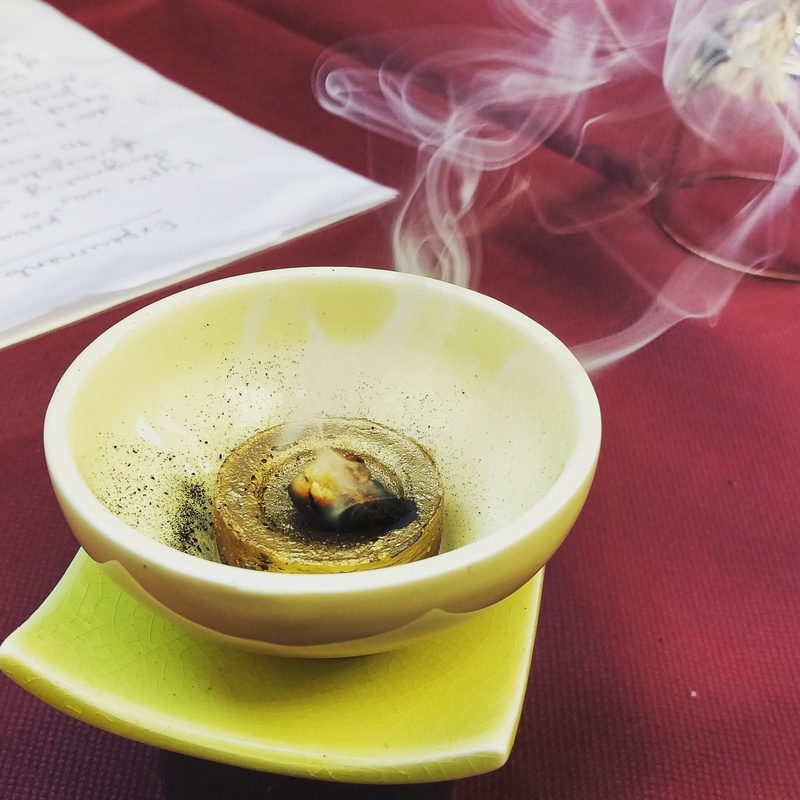 Here we had a chance to start sniffing out for ourselves the similarities and differences between both unburnt and burning aromatic substances, including Boswellia, but also a series of kyphi (a compound incense of resin, herbs, and spices) made up according to different recipes. Once I’d got over the fact that these look a lot like giant rabbit droppings(!) I found the whole sensory experience very enlightening. I also found myself very (visually) interested in the smoke each burning pellet was giving off. Perhaps this was because I was trying to capture an olfactory experience using the visual device of my camera, but I hadn’t expected this. The visual impact of the smoke, slowly but intently rising straight upwards, or curling wistfully around the dish, as well as how that movement changed depending upon whether the pellets of kyphi or the grain of Boswellia was newly alight or burning itself down, was unexpected. I could also smell a more familiar scent pervading proceedings: that of smoke. A scent I expect I am just more attuned to. The demonstrations took place outside (with, rather ironically, a ‘no smoking area’ sign watching on) so it was difficult to tell how concentrated the different scents, both alone and in combination, would have been in a more enclosed space. Cumulatively, the scent did gradually become quite powerful (I started to get a headache, but that may partly have been a consequence of so much concerted sniffing), and that made me think again about how different participants in ancient rites might have experienced the power of incense differently depending upon their proximity to the altar and the nature of the space in which it was burned. One thing that was definitely noticeable was how the scent worked its way into our clothing (Esther’s subsequent keynote must have been one of the most fragrant of all time). The following day Sarah Bond gave an excellent paper on ‘Incense for nightfall’ which made me reflect further on this as she suggested that the use of kyphi to create ‘night air’ in bedrooms, and to bring about deep sleep and good dreams, might have given the bedrooms of the Roman domus a particularly discrete smellscape. She noted Jo Berry’s suggestion that such areas might be closed off using curtains, which – coupled with my own experiences the day before – made me wonder how fabrics might indeed soak up certain scents and preserve them for longer than other materials. Smell might therefore not always permeate and cross boundaries in the way that it is often assumed to do, or at least not so freely. I came away with plenty to think about, as well as a new determination to hone my skills of olfactory perception!